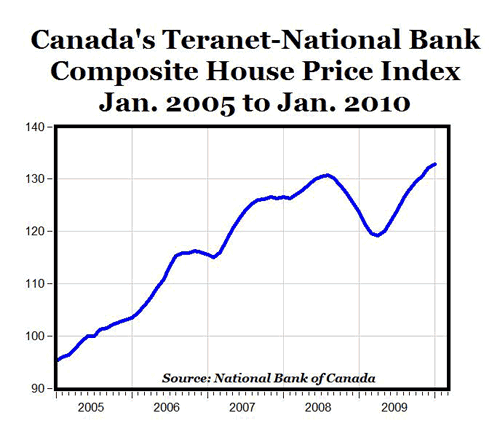 Canadian home prices in January were up 7.5% from a year earlier, according to the Teranet-National Bank National Composite House Price Index (see top chart above), which was released today. January was the fourth consecutive month in which prices increased from a year earlier, after 10 consecutive months of 12-month deflation. The turnaround is due to nine straight monthly increases in the countrywide index (see bottom chart above) that followed eight straight monthly decreases. Compared to the previous peak in August 2008, home prices in Canada have increased by 1.6%, to set a new record high level in January. 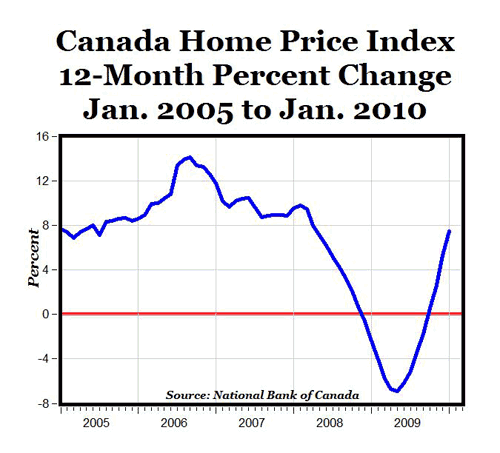 To get an idea how home prices in Canada compare to the U.S. since 2001, the chart below tells the story. Home prices in both countries increased by about 80% since 2001, but peaked much earlier in the U.S. (early 2006) than in Canada (mid-2008), and U.S. home prices fell by much more from the peak (-30%) compared to the drop in Canada (-9%). Home prices have now completely recovered in Canada, whereas it might be many years before home prices in the U.S. return to the 2006 level.